By breaking through an exchange rate of 6.50 yuan to the dollar on Friday, China’s currency passed through one of those symbolic milestones beloved of market commentators. Thumbing through our records we see that level was last reached in 1993. A lot of Chinese exports have flowed under the bridge since then. While a spurt of yuan appreciation usually precedes Sino-American talks (there is a round due in Washington mid-May), the People’s Bank of China seems now to be belatedly letting the yuan shoulder more of the burden of fighting inflation, by making energy and food imports cheaper. The currency has gained almost a full percentage point against the dollar this month, as much as it was allowed in the whole first quarter. Since Beijing freed the yuan from its dollar peg in 2005, with a near two-year repegging after the global financial crisis hit in 2008, the yuan has gained 27.5% against the dollar under the central bank’s managed appreciation regime. Since it was unpegged for a second time in June 2010 the yuan has appreciated 4.6% against the dollar, though it has depreciated in nominal effective terms. 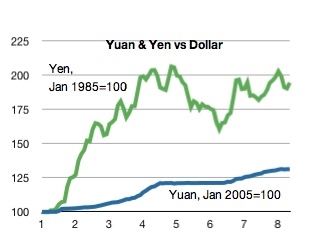 As the chart below, from the World Bank, shows, the yuan’ effect exchange rate has been trending up if not by as much as the nominal figures for its appreciation against the dollar might have one imagine. REER stands for real (i.e. inflation-adjusted) effective exchange rate (the value against a trade-weighted basket of currencies), NEER for nominal effective exchange rate. Note the widening gap between the two since mid-2010 during which time exports have been resurgent. The question for investors now is whether April’s appreciation against the dollar signals a willingness on the central bank’s part to step up the pace of appreciation of the currency in the face of stubbornly high inflation, or, as we suspect, just that it plans to continue to let the yuan rise as it has been doing. The attempt of two U.S. lawmakers to reintroduce legislation that would let the U.S. impose emergency tariffs against China if its currency is found to be undervalued, isn’t likely to get any farther than it has on previous occasions, even though its language is toned down from before. There aren’t sufficient Republican votes for such a measure and the Republican leadership’s priorities are more domestic issues. Even if the bill did somehow manage to pass the House of Representatives, as it did last time, it would likely again die in the Senate. Last week, the U.S. Treasury, in a biannual report to Congress politely delayed until after President Hu Jintao’s state visit to Washington, declined to label China a currency manipulator, but said progress toward allowing the yuan to appreciate was “insufficient”. 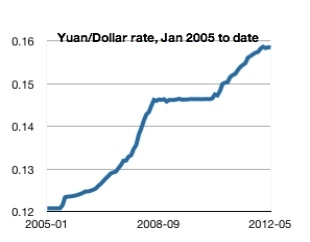 The yuan has risen only 3.64% against the dollar since it was unpegged from the greenback in June 2010. The currency hit a new high against the dollar on Thursday, at 6.585, displaying its usual upward mobility ahead of a G-20 finance ministers’ meeting. The ministers convene with central bankers in Paris next week to follow up on pledges made at the G-20 summit in Seoul to move towards market-determined exchange rates and to shun competitive devaluations. The U.S. has been trying to make common cause with Brazil to put pressure on Beijing to accelerate the yuan’s appreciation, and the International Monetary Fund has been dangling the carrot of inclusion in the basket of currencies on which its Special Drawing Rights are based but for which the yuan would have to be freely tradeable. Yet China is likely to hold its line that its currency needs to appreciate gradually to avoid social dislocation, and switch attention to what it sees as the damaging effects of the U.S. Federal Reserve’s quantitative easing and capital flows into emerging economies causing imported inflation. Another Small Step In The Yuan’s Internationaliztion. Bank of China’s new if limited yuan trading facility for its U.S. customers is another small step in the direction of internationalizing the currency. It is the first time customers can to buy and sell yuan using accounts at the state-owned bank’s U.S. branches, rather than go through Hong Kong. A limit of 20,000 yuan ($3,000) a day can be bought per individual’s account, the same cap that applies in Hong Kong to limit speculation. Business accounts are uncapped. Beijing has been pushing its importers and exports to settle trade less in dollars and more in yuan, and allowing the development of an offshore market in the yuan. Cross-border trade settlements in Hong Kong grew from an average of 4 billion yuan a month in the first half of last year to 68 billion yuan in October. China Bank of Construction forecast recently that this number could reach 1.6 trillion yuan a month by 2015. However, the trend is more pronounced in the trade with countries other than the U.S. Nevertheless, it has helped swell the yuan deposit base in Hong Kong to 260 billion yuan at end-November 2010, and the introduction of markets in the currency and of yuan-denominated financial instruments, including so-called dim sum bonds. Trading in the currency was allowed in Hong Kong last July. Daily trading has now reached $400 million. Given $4 trillion is the total of all daily currency trading, the internationalization of the yuan still has a long way to go, but it is clear where it is headed however cautiously. If there is one thing that can be said about the newly-concluded G-20 summit in Seoul it is that everyone can claim it was a success, without having to do anything immediately about it, and certainly not the same thing. The final communiqué’s wording left open many interpretations of its headline commitments, that the major economies have agreed to refrain from competitive devaluations, that they will get the IMF to come up with indicative guidelines to tackle imbalances, and give emerging economies a bigger say in the IMF. So on to the APEC summit in Yokohama for many of the G-20 leaders to reprise many of the same economic issues with similar lack of progress. Meanwhile, this Bystander feels, the Seoul Action Plan, for, yes, the G-20’s communiqué lays it out, will be rather like the revaluation of the yuan, all in its own time. This post was first published on Market Bystander.